Belong to a Russian comedy fantasy movie, The Last Knight or known as Last Warrior is a best seller movie of 2017. The movie is directed by Dmitry Dyachenko. It involves the story of two famous characters in traditional Russian fairy tales, both villains named Baba Yaga and Koschei. It was released in October, 2017. Since it’s released, the movie soon became the highest sales release of all time and also holds the 12th biggest box office audience. The story takes place in fantasy country of Belogorie or White Hills. In which the character Ivan – a modern Moscow guy – suddenly find himself trapped in the magical world, there he has to get involved in a battle between light and dark. Having no idea of what happened and what role should he do make the plot story interesting and funny. That’s the reason of why this movie is worth to watch. Used past historical background as the theme, Viking is directed by Andrei Kravchuk. 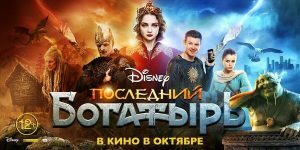 The movie was released at December 29, 2016 in Russia and January 6,2017 in other countries. Soon after the release, the movie got the total of USS 33,7 million box office in Russia and worldwide. The plot of the movie tells a story of Prince Vladimir the Great who has to battle against his half-brother Yaropolk, who has killed his other brother Oleg and also to conquer the territory of his late father. In the effort to conquer Kievan Rus back, Vladimir was supported by the Viking mercenaries led by Swedish captain. This fully intrigued movie is worth to watch. Directed by Fyodor Bondarchuk, the genre brought in this movie is science-fiction drama. It was released in January 26, 2017. This became a box office hit in the sci-fi movie category. The movie entitled Attraction tells a story of an alien spaceship which got heavily crash in a Moscow district Chertanovo. Later than, the government takes an action aimed to all residents to fight against aliens along with the national army’s. Belong to historical action drama happened in space, Salyut 7 is actually based on the 1985 Soyut T-13 mission as the part of the Soviet Salyut programme. This epic movie is directed by Klim Shipenko. The lead male is a historical heroic character, cosmonauts Vladimir Fyodorov. The story line is about Vladimir as the commander along with his co-pilot Viktor Savinykh, who are sent to do a mission, that is to make a broken or nearly dead space station back safe into service. What a challenging and heroically mission to be completed. Will they succeed the mission? Let’s watch this movie and see what happen to the rescue. Also known as furious, this movie is successfully amazed the viewers with the epic story. The director behind this artwork is Ivan Shurkhovetskiy. He made this movie based from the famous military chronicle in Russian literature. This was released in November 30, 2017 and has received around USS 10 million box offices. The movie is made based from the tale of destruction of Ryazan, a medieval military chronicle about Mongol invasion of Russia in 1237. The movie in general told the story of Evpaty Kolovrat who has traumatized syndrome due to the past violent by Mongols invasion, later he got married with Anastasia and became a great Knight of Ryazan. But the suffering did not end here. Would he able to overcome his traumatic syndrome? And became a true Great Knight? Well, lots of international viewers have rated this movie with good review, now its your time to watch this masterpiece. Also known as Spacewalk, this movie is considered as box office bomb due to the wide spread praise that it got. And also belongs to one of the most successful Russian movies of the year 2017. Directed by Dmitry Kiselev, he brings the genre of historical drama. It was released on April 6, 2017. The movie is actually based on the real story of Voskhod 2, a Soviet space mission in 1965. In general, the Age of Pioners is a movie about cosmonaut Alexey Leonov and his mission to do space journey, in order to be the first human who performs a spacewalk. This movie is a fantasy superhero movie which is directed by Sarik Andreasyan. Released in February, 2017, the movie then became a box office bomb in Russia. Guardian’s movie concept is almost the same with the superhero movie in US. The movie tells a story of Russian superheroes team which were created during the period of Cold War. They were assigned to battle against a dangerous scientist. Having united as one team, they actually come from different strength and traditions which represents people of the USSR. Directed by Andrei Zvyagintsev, Loveless is a tragedy drama movie which was released in June, 2017. After the debut release, the movie soon gets the achievement in International Filming Award, including the Awards from Cannes Jury Prize, and Cesar Award for Best Foreign Language Film category. This movie is about Russian couple who are tired with their marriage life as they decide to divorce and start a new life with their each partner. They already have one son – 12 years old boy – when suddenly went missing after witnessing their fights. Would they reunite as one whole family after they find their son?